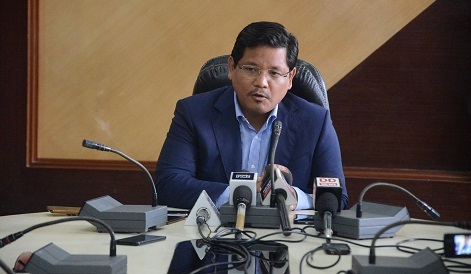 Meghalaya chief minister Conrad Sangma on Monday said the government has not yet decided to call off the operations to rescue 15 miners trapped inside a 370 feet deep coal mine for more than a month in East Jaintia Hills district. Hearing a PIL filed by Delhi-based lawyer Aditya N Prasad against the Centre for failing to rescue the miners, a Supreme Court bench comprising of Justices AK Sikri and S Abdul Nazeer on Monday expressed concern over the progress of the rescue operation. Solicitor general Tushar Mehta assured the court that there was no question of abandoning the rescue operation. “We are not yet decided on that (aborting the rescue operation). We are going to take inputs from all the experts from different organisations involved in the rescue operation,” Sangma told journalists here in Meghalaya. “Once we get the report from all of them, then it will be appropriate for us to decide on how to move forward,” he said. On Sunday, the Indian Navy “suspended” its operation in retrieving the body from the mine as the body was disintegrating with every pull. Deputy commissioner FM Dopth could not be reached for his comment. Petitioner Prasad, meanwhile, told the apex court that the hesitation of the central and Meghalaya governments to requisition the Army and Air Force to provide logistic support violated Article 21 of the Constitution. He suggested the court to direct the Defence Ministry to airlift men and equipments through helicopters which can directly land at the helipad constructed on the site without any delay. Prasad urged the apex court to instruct the Meghalaya government to issue a nation-wide public appeal seeking any equipment that may be required in the rescue operation so that private and public sector units may volunteer them free of charge.